Hearing that the 35.05m motor yacht Missy B II has been sold, I contact her listing agent, Michael DiCondia at Hargrave Yachts who confirms the deal is done, with Geoff Lovett at Geoff Lovett International in Australia introducing the buyer. Missy B II was built by Hargrave in 2004 and refitted in 2010. Alfresco dining is on the aft deck with a table facing out to stunning views of the sea or anchorage beyond. Her interior by Shelley Higgins is open plan and comfortable, with a large seating area and dining table leading to the country style galley. The lower deck accommodates up to 10 guests in a full-beam master suite, 3 double staterooms and a twin cabin, all with en-suite facilities. 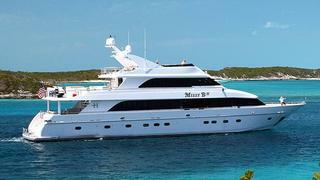 Twin 1400hp Caterpillar engines give Missy B II a cruising speed of 12 knots and a maximum speed of 17 knots and she was asking $6.8 million. Michael says she'll be loaded onto a ship on Monday bound for her new home in Brisbane, Australia, and retains her name.